Store-bought mayonnaise nearly always contain refined vegetable oils such as canola oil — definitely not part of a healthy, natural diet! You don’t have to give up this creamy, tasty condiment though. The mayo below can be substituted for commercial mayo in any of your favorite recipes, mixed with herbs for dips and sauces, or used alone as a sandwich spread. This would make a great coleslaw dressing! Place the egg yolks and vinegar into the blender and blend. Continue blending while slowly pouring in the coconut oil, no more than a tablespoon at a time. If you add the oil too quickly, your mayo won’t thicken. Blend until creamy, and use immediately. 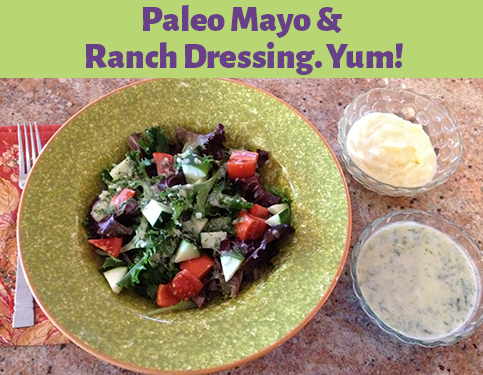 Use your homemade mayo in this Ranch Dressing recipe for a delicious, guilt-free salad topping. Kids will also enjoy a little cup of dressing to dip their raw veggies in. This is very tasty! Mix mayo, coconut milk, and dried spices well with a fork. Crush garlic and finely chop all fresh herbs, and gently fold in.